28 / the tasting panel / december 2016 1 JAB Clear, legible label, solid branding. Pow, right in the kisser. 2 JABS Eye catching label and memorable branding. This one's got a one two punch. 3 JABS Creatively inspiring in both packaging and branding. I'm seeing stars and parakeets. 4 JABS A near work of art and meaningful branding. Might not last another round. 5 JABS A masterpiece in packaging and new benchmark in branding. An instant knock-out! D ecember is my birth month, and I hate my birthday because it's on Christmas. (But I love Christmas!) What sort of person has a baby on Christmas? Who would do that to their child? One thing I will say seriously about having a birthday on a day when everyone else gets presents is that it's humbling, which is a quality I like in people and wine. That said, this month's wines are somehow unassuming and all the more delicious for it. Saturday Night 2012 Red Wine Blend, California ($11) Bright cherry, ripe blue fruits and Twizzlers traverse alongside sweet cinnamon in a medium- plus body. 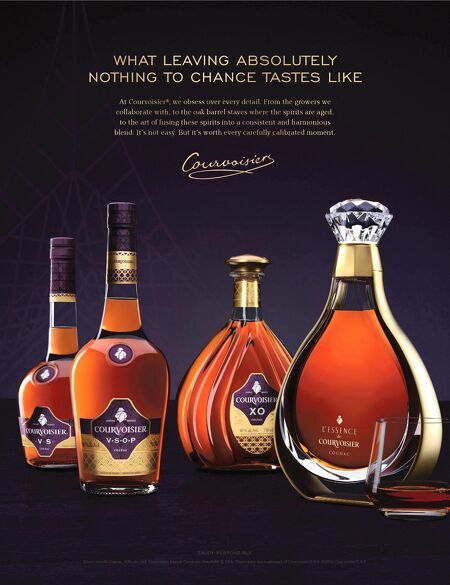 The photo-realistic image on the label is different, yet very alluring. From afar it looks like Marilyn Monroe and Alec Baldwin are having dinner at an Italian restaurant, and I would totally want to be invited to that. I also love the bold simplicity of a name that suggests a no-fuss yet just as special Italian family-style Saturday night dinner. Personally, I want to pair this with some Kate McKinnon and SNL. 86 R.S. LIPMAN COMPANY M. Chapoutier 2014 Marius Vermentino, Pay d'Oc, France ($10) Although this is called a Vermentino, it's actually 32% Terret. Lots of white here: white peach, white flowers, white grapefruit and a touch of celery salt in this medium-bodied (more than anticipated) Vermentino. Excellent value. The packaging is simple yet engaging. There is also braille on the label, which is rarely found. Kudos. 88 TERLATO WINES Lonely Cow 2014 Sauvignon Blanc, Marlborough, New Zealand ($14) No skimping of tropical fruits here—lychee, kumquat, pineapple and mango countered by lemon pith and white pepper. Delicious and simple. I love the name "Lonely Cow." Poor cow, why is he/she lonely? Will I ever know? In fact, I will, because I looked it up: It's a reference to a Kiwi joke about a guy who, when asking for directions, confuses a "Lone Nikau" (a type of tree) for a "Lonely Cow." Usually Kiwis are pretty funny (like my boyfriend Jemaine Clement), but these guys should stick to making wine. 89 R.S. LIPMAN COMPANY De Tierra 2012 Pinot Noir, Russel Estate, Monterey, California ($55) High-toned cherry and strawberry jam in this well-made Monterey Pinot Noir, balanced by tomato leaf, English tea and crushed rock earthiness. De Tierra is a boutique, organic, estate- grown female-run winery. This bottle itself is simple, but the rosé and Riesling bottles are gorgeous. In the meantime, this Pinot is too darn good to not talk about. 92 The Cleaver 2014 Red Blend, California ($19.99) Cherry liquor, ripe plum, damp soil, cedar and lots of vanilla in this bigger, sappy red blend. 74% Zinfandel, 21% Petite Sirah and 5% Syrah aged 16 months in 30% new French oak. Gets two JABS for clever marketing approach as a "must for meat." I know a lot of dudes who would buy this. 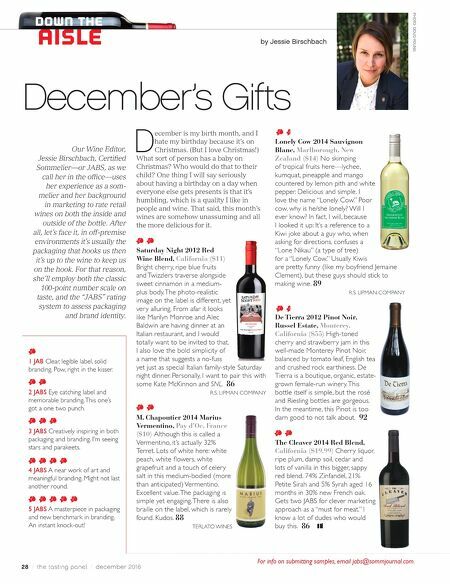 86 December's Gifts by Jessie Birschbach Our Wine Editor, Jessie Birschbach, Certified Sommelier—or JABS, as we call her in the office—uses her experience as a som- melier and her background in marketing to rate retail wines on both the inside and outside of the bottle. After all, let's face it, in off-premise environments it's usually the packaging that hooks us then it's up to the wine to keep us on the hook. For that reason, she'll employ both the classic 100-point number scale on taste, and the "JABS" rating system to assess packaging and brand identity. PHOTO: DOUG YOUNG For info on submitting samples, email jabs@sommjournal.com.